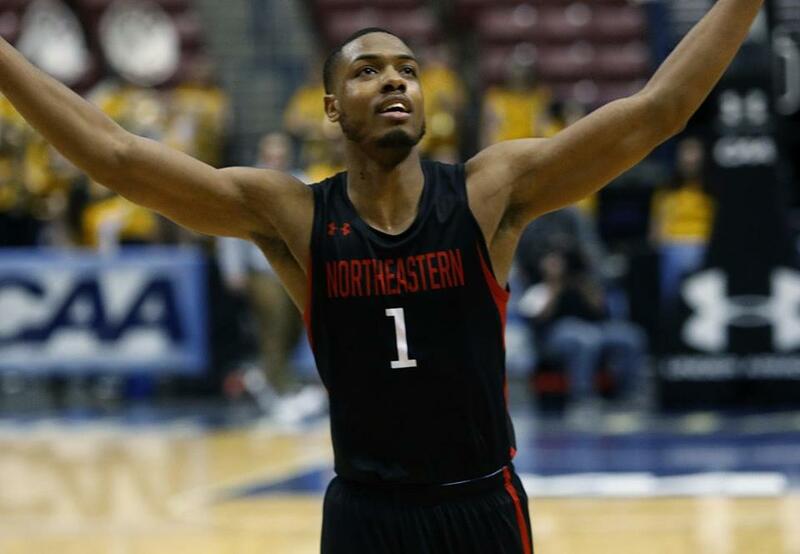 Shawn Occeus and Northeastern start off against Kansas. 7. Louisville (20-13) vs. 10. Minnesota (21-13), 12:15, CBS: Minnesota coach Richard Pitino faces the school that fired his father. I guess if you need extra incentive, that helps, but he’ll have enough problems with the Cardinals, who have had some excellent victories this season, including North Carolina and Michigan State. However, they finished the season losing five of seven. Minnesota has talent, especially Jordan Murphy and Amir Coffey, but lacks depth. 2. Michigan State (28-6) vs. 15. Bradley (20-14), 2:45 p.m., CBS: Spartans coach Tom Izzo has done it in Belichick fashion, overcoming injuries to have his team ready to contend in March. His point guard, Cassius Winston, has a lot to do with that. He averages 18.9 ppg and 7.5 apg. Bradley was an upset winner in a down year for the Missouri Valley. Pint-sized guard Darrell Brown is a dangerous 3-point shooter. 3. LSU (26-6) vs. 14. Yale (22-7), 12:40 p.m., truTV: LSU will be missing its coach, Will Wade, because of his involvement in an FBI investigation of recruiting violations, but the Tigers still have all the players he recruited, most notably point guard Tremont Waters (15.1 ppg, 5.9 apg). Yale isn’t like many other Ivy League teams you’ve seen in the past. The Bulldogs have good shooters, like those teams, but they’re athletic and play fast. Yale guard Miye Oni is a pro prospect. Upset alert. 6. Maryland (22-10) vs. 11. Belmont (27-5), 3:10 p.m., truTV: Maryland is young but the Terps have three good ingredients: point guard Anthony Cowan and quality big men Bruno Fernando and Jalen Smith. Belmont, a relative unknown from the Ohio Valley Conference, has a great coach (Rick Byrd) and player (NBA prospect Dylan Windler). The Bruins will make this competitive. 6. Villanova (25-9) vs. 11. Saint Mary’s (22-11), 7:20 p.m., TBS: Villanova, behind seniors Phil Booth and Eric Paschall, hung tough after some early-season problems to win the Big East. Saint Mary’s stunned Gonzaga in the WCC tournament final to get here. The Gaels improved as the season ended and are led by guard Jordan Ford, who will launch a 3-pointer at any time from anywhere. 3. Purdue (23-9) vs. 14. Old Dominion (26-8), 9:50 p.m., TBS: The Boilermakers had an amazing season as a basically new team except for star guard Carsen Edwards and proved to be one of the best in the Big Ten. Unusually, Edwards, while still good, fell short of All-American hype but the team exceeded expectations. They have a tough matchup with ODU, a veteran team led by guards B.J. Stith and Ahmad Caver. 5. Auburn (26-9) vs. 12. New Mexico State (30-4), 1:30 p.m., TNT: Auburn looked great, like the team it was earlier in the season, while winning the SEC tournament. However, it has to ship to Salt Lake and play an early game. Not easy. Fun TV watching game: See if you can predict and document when Tennessee coach Bruce Pearl will start sweating through his shirt. New Mexico State has a great record, but the Aggies dominated a weak league, the WAC. They’ll have to be playing at their best to have a chance. 4. Kansas (25-9) vs. 13. Northeastern (23-10), 4 p.m., TNT: With an admitted bias, I wish the Huskies could have gotten a different opponent in a better location. Despite what most people classify as a down year, Kansas still has loads of talent. No one on the Northeastern roster would start for Kansas, but the Huskies are well-coached by Bill Coen — gritty, tough defenders and good 3-point shooters. They have a chance if they slow the pace, hit their threes, and don’t get dominated inside by Kansas big man Dedric Lawson. 2. Kentucky (27-6) vs. 15. Abilene Christian (27-6), 7:10 p.m., CBS: Even John Calipari can’t find anything to fear in this mismatch. The Wildcats improved at both ends of the floor as the season progressed. It won’t take much of an effort to ruin Abilene’s first NCAA bid. The most interesting former Abilene athlete: Randall “Tex’’ Cobb. Google him. 7. Wofford (29-4) vs. 10. Seton Hall (20-13), 9:40 p.m., CBS: Regular readers will know of my fascination with Wofford. The Terriers have Fletcher Magee, who could set the career NCAA record for 3-pointers in this game, but they also have a full roster that will play the Hall tough. Seton Hall’s star guard, Myles Powell, is a streaky, clutch 3-point shooter who can turn games around by himself. 4. Florida State (27-7) vs. 13. Vermont (27-6), 2 p.m., TBS: Vermont is always interesting, and its star player, Anthony Lamb, scored 24 in a loss at Kansas this season, but it will be difficult to overcome the size and depth of Florida State. The Seminoles are gigantic across the board, and coach Leonard Hamilton will use 11 or 12 players. 5. Marquette (24-9) vs. 12. Murray State (27-4), 4:30 p.m., TBS: Marquette is baffling. It has an All-American in guard in Markus Howard and plenty of other talent but somehow managed to lose five of its last six games and blow the Big East regular-season title. Murray has marvelous point guard Ja Morant (24.6 ppg, 10.0 apg). Here’s your challenge: Figure out whether Morant is lefthanded or righthanded. 7. Nevada (29-4) vs. 10. Florida (19-15), 6:50 p.m., TNT: Florida has lived on the bubble for two months, and a victory over LSU in the SEC tournament finalized the Gators’ berth. They have flaws; they don’t shoot or rebound well. They’ll need their best player, KeVaughn Allen, to play well. Despite its great record, Nevada has been overlooked. When the Wolfpack are playing well, and not just chucking up 3-pointers, they can play with anyone. 2. Michigan (28-6) vs. 15. Montana (26-8), 9:20 p.m., TNT: Michigan has had surprising success as a team with no star. The Wolverines have multiple players who make contributions, and they win with defense, giving up 58.6 ppg, third in the country. Montana relies on a veteran trio of Sayeed Pridgett, Ahmaad Rorie, and Michael Oguine. The Grizz have had an accomplished season in the Big Sky, but can’t compete in this one. 1. Gonzaga (30-3) vs. 16. Fairleigh Dickinson (21-13), 7:27 p.m., truTV: Gonzaga has vaporized the competition all season, winning games by an average margin of 23.8 points, which leads the nation. They’re the best shooting team, too, at an astounding 53.6 percent. They’re big, fast, and good defenders. A national championship should be the goal. FDU will try to make it a halfcourt game and hope center Mike Holloway, the brother of UMass center Rashaan Holloway, can have success near the rim. 8. Syracuse (20-13) vs. 9. Baylor (19-13), 9:57 p.m., truTV: The winner of this game will be the team that solves the opponents’ tricky zone defense. Syracuse also needs a big game from guard Tyus Battle, who’s capable of winning games by himself but sometimes disappears. Baylor did enough to make the field but finished with a four-game losing streak. Guard Makai Mason, a Yale transfer, has played well in the tournament before with the Bulldogs; his new team needs him to do it again.